I was told Johnny Lee’s recording studio housed Richard Manuel’s piano. Paul Barrere had suggested we make use of Johnny’s place to record our next project. Not that I needed any persuading--Johnny’s studio is legendary. It is a converted garage separated from his home in the back on a quiet street in Studio City. What gives the studio a feeling of comfort is not just the coziness of the place, it is the man himself. The studio’s compact style and country-western art (as in Roy Rodgers and Gene Autry) with Gunsmoke and Have Gun - Will Travel on a television up on the back wall are a reflection of Johnny Lee and his laid-back style. You feel like you are at home, and you are. He’s a great engineer and a wonderful musician—he plays just about everything. During Little Feat’s time there for the Rooster Rag sessions he sang some amazingly soulful and sophisticated background vocal arrangements on “Church Falling Down,” “Rag Top Down,” and “Salome”—I’d been completely unaware of his considerable vocal abilities. Still, I was intrigued by what the piano might sound like, what condition it was in, and how Johnny would handle the leakage from other instruments and amps given the tightness of the room—the piano was in the control room. We would all be in the control room during the recording process, with the exception of Gabe Ford, who spent his time almost directly behind the piano through a thin wall and door in a room used for vocals and drums. When I played the piano for the first time, all my questions were answered and then some. “The piano damn near plays itself!” was my thinking. Tony Braunagel, a great drummer, producer, and long time friend of Little Feat, and I were talking about that very subject up in San Francisco a few weeks later. I was sitting in with Tony and Johnny Lee, along with Texacali horns Darrell Leonard and Joe Sublett (who played on our record), for a gig with the Blues Brothers. I laughed, telling him I felt the same way. The truth is, it’s a Steinway. This one in particular has the “magic” (a word I tend to use a lot, but I always mean it). A few weeks later I called Johnny Lee and asked him about the history of the instrument, starting with when he first became acquainted with it. Johnny Lee was at Shangri La studios recording a project with Ian McLagan, his second solo album. And although he was there to play guitar, he would show up early just to play the piano. Johnny knew it was Richard Manuel’s. He loved the touch and the way it sounded—always a winning combination for a musician and an instrument. A good handshake. The studio, which had played host to many artists over the years: Bob Dylan, The Band, Bonnie Raitt, Tom Waits, Eric Clapton, and others, was not too long after put up for sale, along with the gear, including the piano. Money changed hands, the piano took a journey to Connecticut, did an about face not too long after and headed west again, this time landing in storage in Tarzana, CA. (Yes, Tarzana has a lineage to Edgar Rice Burroughs character, Tarzan.) Thankfully, through a series of maneuvers and continued changing hands, the piano eventually wound up, through barter, with Johnny Lee Schell. As Johnny was familiar with the instrument and had a warm place in his heart for it, he made some repairs: replaced a couple of broken keys and other minor fixes, and had the piano restrung. There were marks on the inside of the sounding board where a Helpinstill pickup had been placed—the device was used to amplify the sound at live venues. It was something straight out of the Spanish Inquisition, not very good for the cosmetics of the interior of the piano. I still wanted to know what the deeper connection to Richard Manuel was. Johnny continued the story. Somewhere between 1967 and 1969 (‘67 the year consequently that I graduated from high school), Richard Manuel and Garth Hudson went on a search for a piano. The quest led them to New York, Chicago, and other places in the United States and Canada. They tried out a dozen or so pianos in the process, according to Johnny Lee. Based on that information, I placed a call to Garth Hudson and had a brief conversation about what transpired. And while the details of how it exactly went down are somewhat foggy (he wasn’t able to tell me what other cities, if any, were visited), the search ended (or began and ended) in Poughkeepsie, NY, at Vincitore’s Hudson Valley Piano Center. Garth remembers the two of them going there and that Richard picked out the piano. tour (which Garth confirmed) and, of course, possessed a wonderful tone and touch. Apparently, they were taking it out on the road with the Band and Bob Dylan. Crews are notorious for giving keyboard players hell for having to tote a piano around the world, or just about anywhere, for that matter. One can hardly blame them. (On Waiting For Columbus I promised our crew it would be the last piano they would have to lug around on my behalf. But I insisted on using a real piano for those recordings.) The size of the piano nearly made for a major disaster, as you will read later. I was intrigued by where the instrument was finally found. Garth had mentioned Vincitore’s, so I looked them up on the Internet. I was more than pleasantly surprised by what I discovered. Mr. Vincitore is now ninety-four and plays the clarinet and saxophone every day—a true testament to that philosophy. His oldest son, Jon P. Vincitore, took over managing the business in 1977. He was twelve years of age when he first started working for the family business. His brother, Michael J., has hands-on experience with the technical aspects of the piano, having served an apprenticeship in his early twenties with Daniel Mazzilli, a foreman for Steinway Pianos in New York City. Their sister, Marta Vincitore Robinson, handles the sheet music part of their enterprise along with the bookkeeping responsibilities, which she does in her spare time. I called the store and Marta answered. I told her I was interested in speaking to someone about a piano that Richard Manuel, from The Band, bought in the late sixties. She cheerfully put me through to her brother Michael, and we had a wonderful conversation. Michael, who was seventeen at the time—which would put the date at 1969--remembers three or four members of The Band coming into the store. As they were famous musicians, this was pretty exciting. The level of their musicianship was something Michael made note of. They could really play. He told me his father, a graduate of Julliard, was impressed in particular with Garth Hudson, who played the saxophone as well as keyboards. Michael thought it was a nice piano, that he liked it. Once the decision to buy it happened, he remembers the piano going out for delivery. My discussion with Michael ranged into the broader concepts of what goes into the making of pianos. He told me there is something serendipitous about Steinways. There are certainly many factors that draw people to an instrument: tone and touch the two biggest components. Michael is schooled in the art of regulation, which brings consistency throughout the keyboard by controlling the factors of touch and sound, including its dynamic range (from soft to loud), and the responsiveness to the keys (a hard action or a light action). Does the person sitting down at the instrument want a lighter touch--as Glenn Gould used to demand for his work, in particular, with Bach, or a harder action so one can dig in deeper? How about a less strident high end in the upper part of the keyboard—the highest notes produce a “ringing sound” because of the lack of damper (suppressing the string’s tone by means of inserting felt between the three strings at the top of the instrument for each note, thus the notes ring out less). You can control that and all of the tactile and tonal qualities with regulation of the instrument. Richard’s piano is very forgiving in its touch—it is easy to play, and yet the sound is surprisingly deep and rich on the low end of the sonic spectrum for an instrument under six feet. It is a very soulful piano. I’ve never played one quite like it. Johnny Lee had made a statement to me about its diversity in regard to the styles one could play on it: rock & roll, ballads, and jazz, for example. With the broad vocabulary of any Little Feat album, this was good news, as I played a wide array of musical styles on the album, all of which fit like a glove. 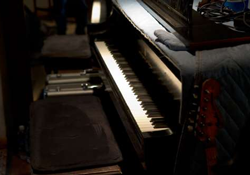 Many recording studio pianos are manipulated by technicians, lacquering the hammers, being one method, to brighten the sound in order to compete with raging guitars, drums, etc. This was not the case with the piano in Johnny Lee’s studio. Richard’s piano has a softer tone that signifies the Steinway “sound.” And although each Steinway is different, Michael insisted to me that the standard employed in manufacturing them is based on creating consistency. Tone and touch can be abetted in an amazing fashion, dramatically, in some cases—thus deviating from the standard and the model of consistency--by any trained technician who has a sense of what the artist wants or wants to explore. I visited Steinway Pianos on 57th Street in New York City in the mid-eighties with Ed Kolakowski, who was the piano tech on the James Taylor tour I was a part of. He introduced me to Franz Mohr, the head of Steinway’s technicians. I was taken down to the basement where I played six or seven of their instruments. Franz casually asked me, but with a twinkle in his eye, if I would care to play Horowitz’s piano—he had just returned from the Soviet Union. Of course I said yes! I sat down and played the low end of the instrument first, which had a thunderous response. I then played the very top end of the piano. The sound was noticeably softer, not dramatically so, but caught my attention. It was when I hit the middle region that I looked up incredulously at Franz—the sound was as if I had pressed the sostenuto pedal, very soft. With a slight shrug of his shoulders and a smile he told me, “That’s the way he likes it voiced.” I never knew how malleable a piano could be until that day. Franz Mohr had taught me an invaluable lesson on how to view a piano and how it might conform to my needs as an artist. I also believe an instrument should challenge the musician, leaving room for growth through exploration, trial and error, while keeping an open mind and making the most of a potent imagination, all of which form a vital link to what is literally one’s relationship with the instrument, a relationship that can last for many, many years. Richard Manuel was looking for and found the “handshake,” which formed his relationship with this wonderful, and in my mind, “magic” piano. Enter Butch Dener into the conversation. Butch was road manager for the Band for many years. I called him to get his take on not only the instrument but some of the dates being tossed about. The Band played at his high school in New Paltz, NY, before a one-off gig with Bob Dylan at the Isle of Wight in 1969, and on Dylan’s two-month concert tour in 1974. It is more than probable that Richard was playing the Steinway purchased from Vincitore’s. I asked Butch if he had any stories about the piano. He led me through the following that took place in 1972. It involves a stash house, some college girls, and a crazed hashish dealer. The Band had some rental properties in and around Bearsville. One of the homes, nestled down a dirt road path deep in the woods, was sublet to four college girls who used it as a “stash house.” The girls were “mules,” transporting drugs to the house, making inventories of what they had, sitting on the load until things cooled off, and then distributing the goods onto the open market. As it happened, the Steinway was also stashed there. Richard Manuel and Rick Danko innocently went over to look in on the piano. The girls, known as the Screaming Mimis (no relation to the group), were working for a hashish dealer, a dangerous character, who had at one point threatened Butch Dener’s life in close proximity to a policeman. The girls happened to make a call to their boss mentioning that the guys were coming over. The dealer (who shall remain nameless) stormed over to the house in an absolute rage. Richard and Rick were confronted with a flailing, shouting, screaming, madman, who told them he was going to destroy the piano. He even made an attempt—he was a black belt and strong as a proverbial ox—to actually lift up the piano from one end and toss it on them. Somehow they were able to talk him off the roof. He finally calmed down as the boys were of no consequence to him or his operation. The piano, along with Richard and Rick, lived to see another day. In investigating this saga I will freely admit that the dates don’t match up with some of the storytellers. Understandable given the number of years ago the events took place. That said, there is no doubt that Richard Manuel and Garth Hudson traveled the short distance from Woodstock to Poughkeepsie (roughly thirty-two miles apart) and found the instrument I played some forty-five years later in Johnny Lee Schell’s studio for the recording of Little Feat’s Rooster Rag. It was a piano well chosen. I enjoyed playing it. I can’t wait to play it again on the next studio recording. I’ve got some songs made for it.